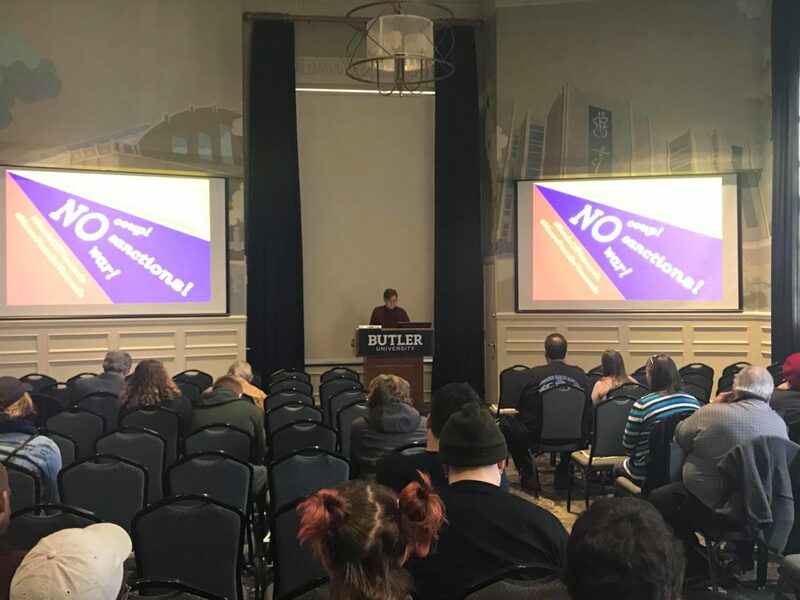 On Saturday, March 23, the Peace In Venezuela Coalition hosted a teach-in at Butler University about the efforts of the United States to intervene and interfere in the affairs of Venezuela. The Peace In Venezuela Coalition is a newly-formed broad coalition of organizations opposed to US intervention in Venezuela, including AFSC Indiana, Answer Indiana, Indianapolis Peace & Justice Center, Jewish Voice for Peace, Muslim Youth Collective, Communist Party USA, Democratic Socialists of America, and the Party for Socialism and Liberation. Local activists and organizers addressed the crowd of forty attendees, detailing the history of imperialism, US imperialism in Latin America, and the gains of the Bolivarian Revolution. Attendees also watched a video from Empire Files exposing and debunking several myths around the coup attempt. Iraq War veteran Mike Prysner, whose experiences in the Iraq War influenced his strong anti-war stance and peace activism, also addressed the audience via videoconference. As a co-producer of Empire Files, he spent time in Venezuela and shared this ground-level eyewitness perspective. Boston-based peace activist Nino Brown also joined electronically to discuss the historical failures of previous anti-war movements and tasks for the anti-war movement today. Previous Previous post: Red4Ed in Indianapolis: The next state to strike?